We will be writing SOUNDS in a different pattern than LETTERS. When we mention a sound, we will also mention a common word to go with it as shown below. Pho/nemes: When educators refer to separate sounds in words, we use the word “phoneme.” A phoneme is a separate sound within a spoken pattern. We are teaching phoneme awareness in many of our exercises and drills in Trickles Reading. Learning Rivers also uses visual cues right on the letter to help the child remember the sound that the letter makes. We turned the letter “a” into an apple, the letter “b” is a bat pushing a ball, and the letter “d” is a doughnut with a dipper. This helps the child differentiate between a “b” or a “d” without thinking about it. Each level comes with Picture Letter flash cards in the back of each book for you to cut out and practice with over and over as needed. Using Picture Letters along with fun activities will help to eliminate learning struggles such as dyslexia, and help with reading, writing and spelling. 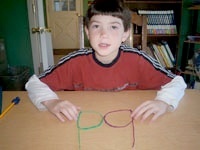 Phonics Games and Hands-on Fun! Spelling Fun: Slap –Clap Game: Everyone claps together around a circle or as a pair. Slap your lap, clap your hands back and forth. The first person spells a word by sound and the next person names the word to the beat. Speak the sound as you slap, then clap. Pick a letter, make a word. Take Scrabble Game letters in a dark bag. Pick out letters from the bag to make words. To begin, pull three letters and make a word if you can. After your first turn pull one more letter to add to your set. Then each turn make as many new words as you can. Write your new words on paper. Count one point for each letter in each word. You only get points for new words. Sound out baseball: Pitch a set of sounds or letters to the batter. If he can say the word which was spelled, he runs to the base. If only one child plays, he gets to make a home run on each word. If more play, have the children move around the bases with each word pitched. Spelling baseball: same as above but the pitcher speaks the word and the student must spell the word pitched in order to run the bases. How many words can you build from one small word? Make as many words as you can from one small word. One point for each letter in your word. .. the bigger, the better. The leader gives the word “all”: The players can make the following words which each contain the base word “all.” (tall, taller, ball, ballboy, call, calling, caller, called, etc…) Note: young children will need help to spell out the words, but they can still speak them and get their points. Rhyme a Word: Say a word and make up every rhyming word you can. Write them on a white board or large piece of paper. (Turn the paper sideways and write one word per page.) Use bright colors to display the new sounds you are learning. Keep your color-words in a notebook for more practice and drill. Build your new words with magnetic letters on the refrigerator. Make words on the table with your picture letter flash cards. Build your new sounds with your fingers.